The fan casing is constructed in heavy gauge polypropylene UV stabilised with the bore specially engineered to provide a tight clearance fit. 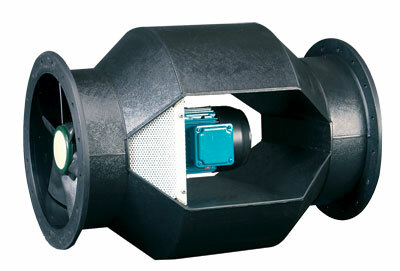 It is complete with drilled flanges at each end to which, either ducting can be directly connected (adequately supported) or, matching flanges with flexible connectors. A high performance aerofoil section axial-flow impeller in durable polypropylene statically and dynamically balanced. Driven through an extension shaft by a totally enclosed, fan cooled single speed motor to BS 5000/99 out of the airstream and is wound to suit standard UK voltages all complete with terminal box (and capacitor on single phase types). The BIF range is available for either single phase 220-240V 50 Hz capacitor start and run or three phase 380-415V 50Hz. An IP54 terminal box is supplied with all models with 20mm and PGII entry offering protection against dust and water jets from any angle.